How to set multiple websites as homepage in Firefox ?? There may be some sites which you want to open every time you launch your browser.You might be looking to set them as homepage.But is it possible ??? "Yes it does,this trick from Lifehacker makes it possible.Follow the steps below for that." Go to tools ---> Options in your Firefox. Now in the main tab , There will be a text box for setting homepage link as shown in the fig. Now Enter the links of the sites which you want to set as homepage separating them with ' | ' as shown in the figure.I set Google and my blog as home pages there. 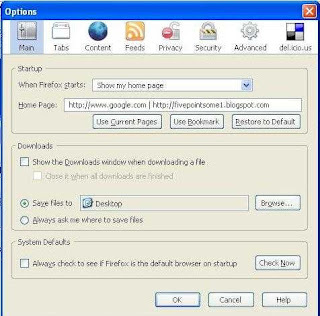 Now restart your Firefox.From next time ,you open the firefox you can see multiple websites loading as your homepages. If you have any tips & tricks , send me along with your link so that I can link you back.